Fecalfeast is cohosting. There are no coaches permitted for this game. This game concluded in a Mafia victory. Base Camp (Observer QT) is here. Advanced Base Camp (Mason QT) is here. Hornbein Couloir (Mafia QT) is here. Day 1: Boxerfred, a Sherpa (Town Vanilla), has been lynched. Night 1: KelsierSC, a Sherpa (Town Vanilla), has been nightkilled. Day 2: Lohengramm, a Sherpa (Town Vanilla), has been lynched. Night 2: Breshke, a Sherpa (Town Vanilla), has been nightkilled. Night 2: ritoky, a Sherpa (Town Vanilla), has been nightkilled. Day 3: GlowingBear, as Lhakpa "Apa" Tenzing (Detective), has been lynched. Night 3: rsoultin, as Pasang Lhamu (Mason), has been nightkilled. Day 4: Mig, the nightwatcher (Mafia Rolecop), has been lynched. Night 4: VayneAuthority, as Dawa Tenzing (Jailer), has been nightkilled. Day 5: ShoCkeyy, as Linzi Ro Akke (Mafia Framer), has been lynched. Night 5: Fidei86, as Dawa Yangsum (Mason), has been nightkilled. Day 6: Onegu, a foreign mountaineer (Town Miller), was lynched. Day 6: NydusHerMain, a Sherpa (Town Vanilla), was endgamed. Day 6: Damdred, a Sherpa (Town Vanilla), was endgamed. Day 6: LightningStrike, a Sherpa (Town Vanilla), was endgamed. Day 6: Holyflare, the tribal commander (Mafia Roleblocker), has survived. Day 6: ruXxar, the militant footsoldier, (Mafia Vanilla), has survived. This is a large normal with heavy flavour. Mountaineering knowledge is not required. There will be a universal silent resolution period of 30 minutes for night actions. A shoutout to Fecalfeast for helping me cohost this game. Win condition: All Bhutanese militants are eliminated or concede or nothing can stop this from happening. The Sherpa are an ethnic group residing largely in the Himalayas. You make your living related to mountaineering and it is in your best interest to protect each other as well as the people that adventure on your turf. You are not one of the Sherpa, but you are climbing Mount Everest, often relying on the Sherpa to navigate the pitfalls of high altitude. You will return as a Bhutanese militant to alignment checks. You are not aware. Several tour groups have situated themselves at both the advanced and main base camps. By day and by night they will help many people achieve their goal of conquering Everest. You are not aware. Also known as the Super Sherpa, this mountaineer has climbed Mount Everest 21 times. Everyone knows him, and he knows everyone so well in mountaineering that he knows where they stand. Each night he can submit the name of a player to check their alignment. A well known mountaineer and outdoorsman, Tsheri is especially known for descents from summit via paraglide. She is also able to sense using any means of transit in the mountain; at night she is able to select one player to investigate his/her whereabouts. As the Super Sherpa’s daughter, you keeps other mountaineers at home on their way to summit. Each night you can select one player to take in for the night. They may not take action on anyone, and are protected from all KP. The Ihawa is a Buddhist shaman that deals with the supernatural and has the power to expel any suspect mountaineers from Everest. (S)he can choose to banish one player per night, where that player will be prevented from taking any action but will also be unaffected by any action taken on them. In 2012, at 16 years of age, Nima was the youngest woman to ever scale Everest. At 19, she’s become a well known guide on summit, booked and in high demand from visiting mountaineers. A regional spiritual leader, his powers can order away one person permanently once per game from the mountains of his choosing. (S)he has only one attempt and if roleblocked, cannot do so again. A mountaineering team that have scaled K2 together, they have gotten to know each other incredibly well over the summer of 2014. They are confirmed town to each other. Win condition: Bring the numbers of the Sherpa equivalent to your level, or to a condition where nothing can stop this from happening. They are Sherpas, except in name only. 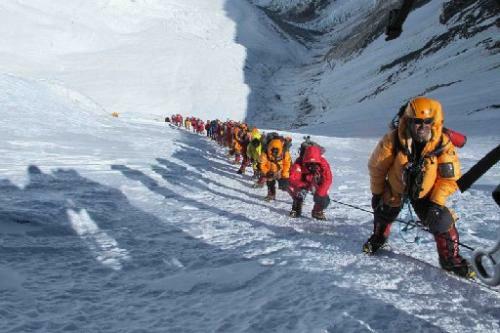 Rogue sherpas loot camps and sabotage equipment, leading to more deaths on Mount Everest. They can only be caught by their actions. Returns Sherpa to alignment checks, and is untrackable. The military commander has many uses of force at his disposal and knows how to stop potential threats to his cause. Once per night he can select one individual whose efforts to hamper and that person cannot take action for the night. A Sherpa exiled by her tribe, she seeks revenge on the community that banished her through sabotage. Each night she can select one individual who will return the opposite alignment when checked. She cannot frame herself. The assassin is stealthy and knows how to survive in the remote regions of the Himalayas, and knows to target the high-profile Sherpas in the region. (S)he has one shot and if roleblocked, loses that bullet. The nightwatcher for the militant camps occasionally is sent out to spy on the Sherpas. Each night, he can check the role of a player. The base of the pyramid for militant attacks, militants carry out attacks on tourists and climbers on the east end of the Himalayas. Mafia under the blue moon. An epic tale of forbidden love, starring the cast of Full House and an ample supply of fanfiction to draw from. Dolph Lundgren is cast as Charles Lindberg where the airplane has guns (like a proper airplane should). (where VayneAuthority channels Chezinu and Chezinu channels VayneAuthority, Caller is host). in which Alakaslam hosts and his flavor text is bound to be revered as the modern day Shakespeare. Nah, I think he's having a laugh with the flavour stuff. Also to clarify there will be no coaches this game. There's a newbie game in progress so if people want coaches, NSM11 is also open for signups. Also I hate you of course. Don't out your teammate next time and you will win faster!